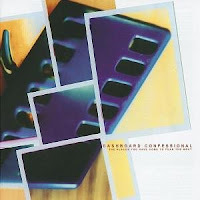 The second Dashboard Confessional album from 2002 is an album that makes me feel sad, uplifted and aware that sometimes a cheesy, slightly bitter love song is still something that I adore even at 36. This is Chris Carrabba's solo stuff and it's all accoustic guitars and laments about an ex. 'Dashboard' became more of a collaborative effort on later albums and although the follow up was good 'they' rather than 'him' were never as good as 'he' was on this album. It's a record that I can sing every word to. There's a live album that contains many of the tracks form 'The Places that You've Come to Fear the Most' performed for MTV Unplugged, in front of a live audience, where every song is sung pretty much by the crowd. It is a break up album. I think it got me through two. It is about mean girls being mean and that. It struck a chord. 'The Best Deceptions' is the best Dashboard song by some distance. This time the girlfriends gone on a trip and played away. She's sorry and wants to get back together. Chris isn't having any of it though. I'd rather say nothing. I'd rather you'd never heard my voice. I should probably point out that this isn't REM. There's no allegory here, no need to figure out the lyrics, but with a bottle of wine and that, 'I've just been dumped,' feeling in your gut it's a super album to sing/vent along with. It never quite measures up to those first three tracks most of the rest of album is about another relationship slowly dying. There are some great lines but deep down I know I love it most of all because it's just a great sing along album. So what that the lyrics sound like some teenager ranting? 'Screaming Infidelities' is one of my favourite songs and 'The Places...' is a good album. Maybe not a great one, but one that I still recommend to everyone. Especially if they've just been dumped. I went through a faze of trying to convert most people I knew into Dashboard and I succeeded with a fair few people, I wonder what Paul thought of it. Go see for yourself. Blog on the Motorway.